Speedex Royal is a palatable energy-rich complementary feed for horses. Mixed in a ratio of 50/50 Speedex Royal and grain provides an optimum feed concentrate including essential nutrients to complement basic roughage. 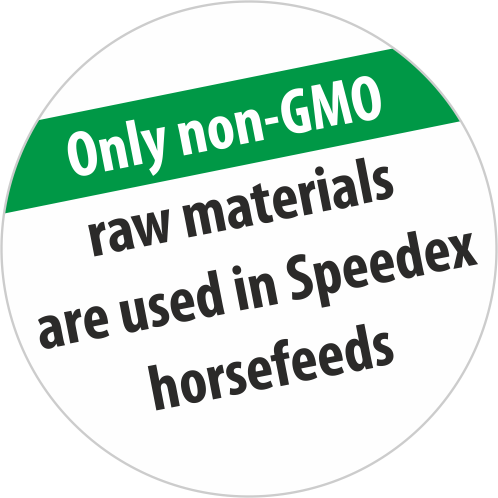 Speedex Royal with the mycotoxin binder MYCOSORB A+®! Feeding MYCOSORB A+®, from Alltech®, reduces mycotoxin absorption, thereby negating the damaging effects of mycotoxins on the health and performance of your horse. wheat bran, barley, wheat, sugar beet pulp, grass meal, linseed cake, vegetable oil, rapeseed cake, calcium carbonate, liquid molasses, salt, premix, soybean meal, monocalcium phosphate, magnesium oxide, lysine, methionine, YEA-SACC®, BIO-MOS®*, SEL-PLEX®, MYCOSORB A+®, flavor.